Anime Wednesdays: Paranoia Agent | It's not your tech, it's how you use it. What’s that, another new segment? That’s right – for those of you who have been with The Classy Geek from the start, you’ll remember that one of the launch articles was a piece I particularly like called What Does Your First Anime Say About You? In that post, I shared some of my first anime titles, and how I think they helped shape and form my personal world view, and invited you to share some of your own – and you’re still welcome to! I recognize that not every geek is a technology geek, a foodie, a music geek, or is fashionably challenged; some of us are Otaku as well (in the most American sense of the word anyway,) and there’s a classy way to indulge in and show off any fandom, regardless of what it may be. We’ll discuss how to pick your titles like movie fans pick their movies – plot, genre, themes, and enjoyability. I’ll help you determine whether or not the title you’re thinking about pulling off the DVD shelf is the best example for the party you’re throwing, or the “friend” you’re bringing home, and trust me – you might want to save the Magical Girl titles for a little later in the relationship, I don’t care how pink and fun and girly it may be, okay? So let’s dive in to our first title, why I wanted to feature it, and why I think you’ll enjoy it. Part of the inspiration for the column came from what I want to spend the first column talking about. At the end of last month, an incredibly inspirational writer, director, and animator for a number of notable Anime movies and television series, Satoshi Kon [ Wikipedia | IMDB ], passed away. His work is particularly influential for me, and his subconcious, subliminal, and psychological method of storytelling earned him fans around the globe, myself included. When I learned he had passed away, I mourned both selfishly because I wouldn’t be able to see new work from him, but also artistically because such an amazing mind is now silent and resting far beyond the reach of any of our ears. He literally wrote his own eulogy in a way, and passed those words along to us so we could all share his last thoughts and feelings before he passed. As much as I respected and admired him before he passed, the heartbreaking and emotional way he described his last tasks and his wishes and desires in those last few days and weeks makes me admire him even more. Paranoia Agent is probably one of the most psychologically and sociologically compelling television series’ I’ve ever come across, completely ignoring the fact that it’s anime. The english dubbing is great, which is somewhat rare (although getting less and less rare these days – the quality of voice dubbing has gone up significantly in recent years, now we just need more voice actors so I can watch more series’ without hearing the same voices in different bodies,) if you want to watch it that way, or you can stick to the original Japanese and watch it subtitled. The entire series is still barely available at Amazon.com , although you may have better luck searching other sites and retailers for it. The story is an anime unlike what you may already think of anime: there are no giant robots or angsty little kids who turn into the unlikely heroes that will save the world. There are no transformation sequences (although that’s not entirely true – but it’s in the most hilariously ironic way possible, trust me) and no sparkles or futuristic suits of armor. The story is set in modern day Japan, where a serial juvenile on a pair of golden roller-blades named “Lil’ Slugger” (Shonen Bat, in Japanese) runs around attacking people for – at first – seemingly no reason. The plot of the story revolves around the people who are affected by or attacked by Lil’ Slugger, how they got to where they are, how they’re connected, and their lives, both in the real world and in their minds. As you watch the series, your first instinct is to try and put the pieces together yourself – to try and assemble a common thread among all of the people who have been attacked by Lil’ Slugger to try and solve the mystery yourself, and alongside you are the detectives in the series themselves who are trying to track down who Lil’ Slugger is and bring him to justice. You’ll learn about their own personalities and quirks, what drives them, and watch as they inch closer and closer to the truth. As that march progresses, the line between reality and fantasy starts to blur more than a little bit, and the surreal starts to make itself more than apparent in the series. Whether the surreal and subconcious are melding or you’re just seeing visions and fictional events through the eyes of the affected people in the series is open to question and interpretation, but what’s clear is that there’s a definite relationship between Lil’ Slugger’s first victim, a shy character designer for an immensely popular children’s television series, the rest of the victims, the detectives assigned to the case of catching Lil’ Slugger, and exactly who or what Lil’ Slugger really is. I’m leaving it here because the Wikipedia plot synopsis contains a few spoilers, so I wouldn’t suggest reading it unless you don’t mind that kind of thing. Paranoia Agent isn’t a fun-time kid’s anime, it’s really not. There are more than a few adult themes, and that goes beyond the obvious violence of a kid running around on roller-blades hitting people with a golden bat. Even so, it’s not so mature that late-teens can’t enjoy it, and it’s not so mature that it’ll turn off the prudish older set. It’s worth watching, especially with someone you can talk to about what you’ve seen, what you think, and what you took away from the series. Satoshi Kon was the director on Paranoia Agent – even though it’s unlike some of his other works that I love where he’s been the animator (Roujin Z) or the writer (Paprika,) he still managed to leave his fingerprints all over it. The series only ran for 13 episodes, half that of a more traditional anime, which makes it a little easier to digest in a shorter period. Because the story is a little dark, real, and makes you question whether what you’re seeing is real, imagined, dreamt, or fantasized, it’s remarkably compelling. The characters quickly become personalities you have a vested interest in, and the typical viewer-to-protagonist relationship dissolves quickly when you follow the twists and turns of the series and are introduced to characters who simply aren’t who they seem to be. The series comes with a healthy dose of social commentary that American audiences can resonate with without needing deep knowledge of Japanese culture or social issues, and explores some dark parts of even the viewer’s psyche as they come to identify – even a little bit – with some of the themes of love, money, corruption, dedication, persistence, guilt, and vulnerability that live in all of the characters. 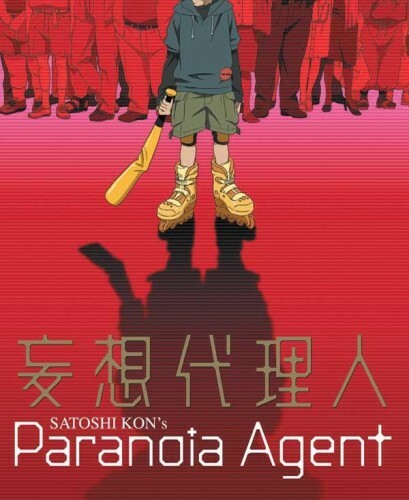 Satoshi Kon’s body of work is much deeper than Paranoia Agent, and I can guarantee we’ll look at more of his work in future installments of Anime Wednesdays, but if you’re looking for a series that gives you a good window into the way he directed and the truly unique mentality that he brought to the table, Paranoia Agent is a good anime to get started with. The kind of dark, mysterious, horror/comedy that Paranoia Agent is is the perfect type of anime that can give even the most die-hard anime fan something great to watch that they’re sure to love, and give the anime newbie something to watch that’s a break from some of the more traditional anime tropes. Once you’ve seen it, you’ll love it, and once you love it, you’ll clamor for more of it. When you do, check back and I’ll help you pick some more of Satoshi Kon’s work that I adore, and some other titles you’ll likely enjoy. Do you have an Anime series, movie, OVA, or short that you think should be features in Anime Wednesdays? Let me know in the comments, and as always, let me know what you think of this column as well! Great article. I'm glad you started with Satoshi Kon, I hope you cover Haibane Renmei in a future issue. And if it's not too popular, maybe even Samurai Champloo. I've yet to see Paranoia Agent, I'll have to add it to my list. I'd like to suggest Ranma 1/2, is that one you've seen? Thanks for the feedback, guys! @David - I think Samurai Champloo is a great pick, especially because it's so GOOD. It's widely popular because while it's definitely a sword-slinging adventure anime, the soundtrack is stellar and the writing and storyline are compelling. I'll definitely cover it! I shamefully admit to not seeing Haibane Renmei yet, though! @Kanundra - Oh yes, I'm definitely familiar with Ranma 1/2, and I have a soft spot for that particular series and for most things Rumiko Takahashi has been behind - she has a formulaic approach to anime that works really well, and Ranma 1/2 was one of her first great successes. Thanks for the suggestions guys, I'll definitely use them all!